April is the month of rain. At least it is in our world: the mid-Atlantic U.S. With sincere apologies to readers who live in current drought, here in Pennsylvania we typically have reminded ourselves that “April showers bring May flowers,” and so we would endure—endure the puddles, the gloomy skies, the downpours, the temporary flooding of streets. But we as a populace need to change our perspective about rain. Rain isn’t an enemy to be fought; nor is it a waste product to be disposed of down a culvert, into a pipe, out-of-sight, out-of-mind. Rain is a life-giving resource, our ally, our friend. And so we propose that we manage rain as the resource and ally that it is, through a strategy we call Artful Rainwater Design or ARD. Make the rain management system overtly celebrate rain. This is such a simple concept—one that the natural landscape has handled brilliantly for millennia: let rock, soil, and plants accept the rain, rather than culverts, catch basins, and pipes. Natural systems perform great ecological service in rainwater management: they can capture sediments, filter toxins, detain rain to prevent a downstream deluge, retain rain and promote its infiltration as groundwater, promote evapotranspiration. Let’s put the landscape to work to manage rain. And, while landscape alone may not control massive flooding, in temperate climates landscape can be designed to manage the majority of rainfall and address the mandates of many US state regulatory agencies to manage “first flush,” the initial (and dirtiest) rainfall. 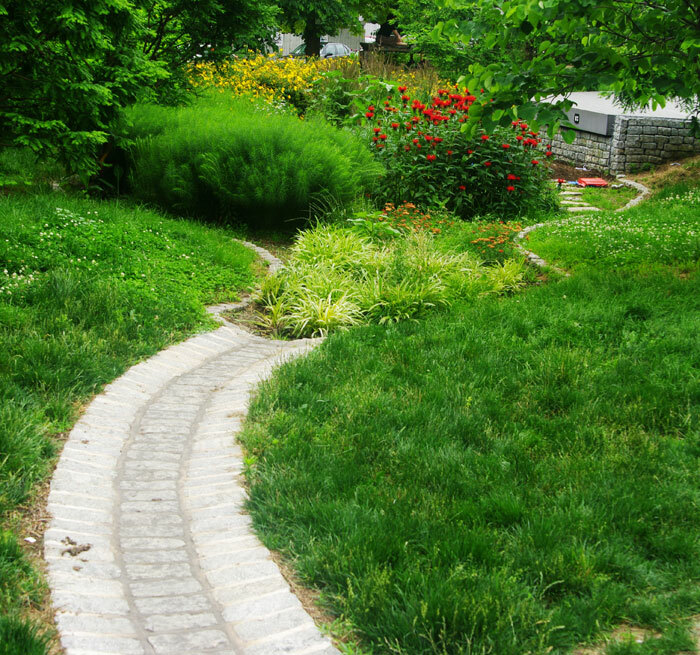 So let’s put the landscape to work, as civil engineer Steve Benz suggests: make the landscape perform, make it do some of the rainwater management heavy lifting that it’s so well-suited to do. Or, to put it another way, “Let’s make room for the rain,” as environmental artist Stacy Levy admonishes. Once we’ve decided to manage rain with green infrastructure, this second step is essential: that landscape system must be perceived as a visual asset by both owners and passersby. The rain garden you create in your yard, the curb extension that a municipality installs to catch and infiltrate first flush on a city street, the retention basin full of perennials that a school plans to serve as outdoor classroom/habitat/rain management system—all must be visually attractive, rich in texture and color, and well maintained. Why is this so important? Because at this early stage of green infrastructure development, we cannot afford for that rain-managing landscape to look unkempt, messy, weedy, feral; we can’t afford for people to accuse a green infrastructure system of being a breeding ground for mosquitos or home of rats and snakes. If the public reacts negatively to the appearance of the first green infrastructure system they encounter, there may not be a second chance. But if the rain-managing landscape is perceived as beautiful and valuable by residents and passersby, then the designers and owners have made a real difference, and ideally have prompted visitors to think, “We need one of those at our house/neighborhood/school/”etc. This is how we can help the public recognize the value of green infrastructure—because work that is truly ecologically sustainable must be loved to be sustained. This is the third and—to our minds—critical step to make a difference in rain management: create a landscape that engages, delights, entertains, or educates people about rain. And this is what transforms a beautiful green infrastructure rain management system into Artful Rainwater Design. 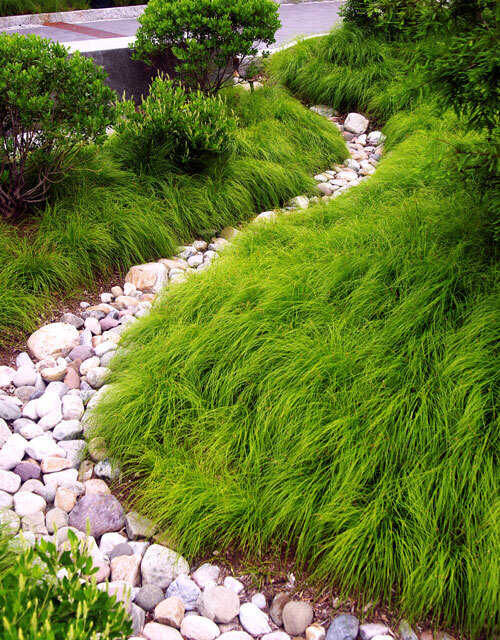 A scupper drops water from a roof to a landscape below; the designed water trail clearly carries the rain to planting beds nearby. Or runoff from a parking lot flows through a robustly-planted filtration bed, then into a stream. Or rain shoots out of a downspout and races through chutes and runnels, disappearing in a large concrete vault. By creatively presenting rain in ways like these, we can take the final, critical step in helping public perception of rain to change. We can create landscape narratives that tell the story of rain’s journey from rooftop to river, from parking lot to pond. We can encourage public reactions to these designs that are delighted realizations: “Look at what the rain is doing!” or “Look—that’s rain!” And by these means, we can help the public not only grasp the value of green infrastructure in terms of management utility and beauty; we can also help the public realize that rain is indeed an ally, our life-giving resource. So it’s April; let’s celebrate rain. Eliza Pennypacker is a professor of landscape architecture at Penn State whose research and teaching about the roots and significance of middle class American landscape taste led her to realize that ecological landscapes must also function aesthetically if they are to be valued and sustained. Stuart Echols is an associate professor of landscape architecture at Penn State whose fascination with surface water systems led to his teaching focus in stormwater management. When stormwater regulations evolved to treat what is known as "first flush" (the initial, dirtiest runoff), he recognized that this treatment strategy has resulted in subtle but significant changes to urban form.